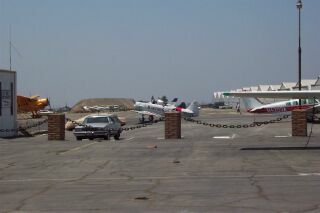 The plane with the Red strip in the background said Marines on it. Not sure just what it is as I know nothing about planes. 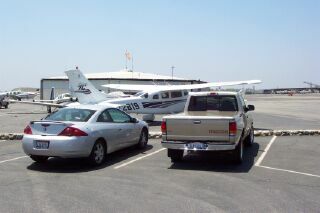 We went to Cable Airport for lunch. There is a really neat little restaurant there named Maniac Mike's. 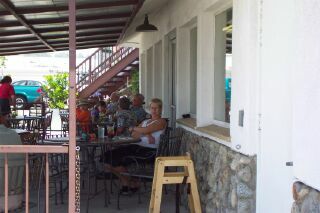 It is a really neat place to sit and eat and watch the planes land and takeoff. It also has a great view of the mountains when it isn't hazy. Here is the lovely Karen after enjoying her lunch. The plane here pulled up after we had parked. The runway is just to the right a little bit and runs right in front of where the truck and plane are parked. The restaurant is just behind me taking the picture. 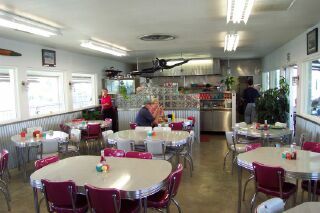 The decor on the inside is like a 50's diner. Check out the chrome edging on those tables. If you can see the glass block wall in the background the edges have broken Fiestaware in them. This was a big deal to Karen and pretty cool. Me.. well... OK. Note the plane hanging from the ceiling. 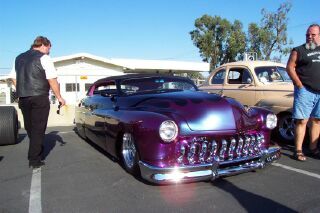 This was taken at yet another car show in Upland later the same day. Just too cool I had to post. One neat low rider.